Last week was our last swimming session for the year and I wanted to make something for the boys teachers. Especially Max's teacher as he gave her a run for her money the first few weeks! So I thought it would be nice to have Max make the gifts. I needed a quick idea so that we could work on it while the baby napped. This was perfect and Max did almost all the work. 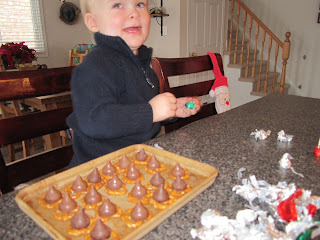 I had him line up all the pretzels then told him that he must open all of the chocolates and place one on each pretzel before he was allowed to eat one. 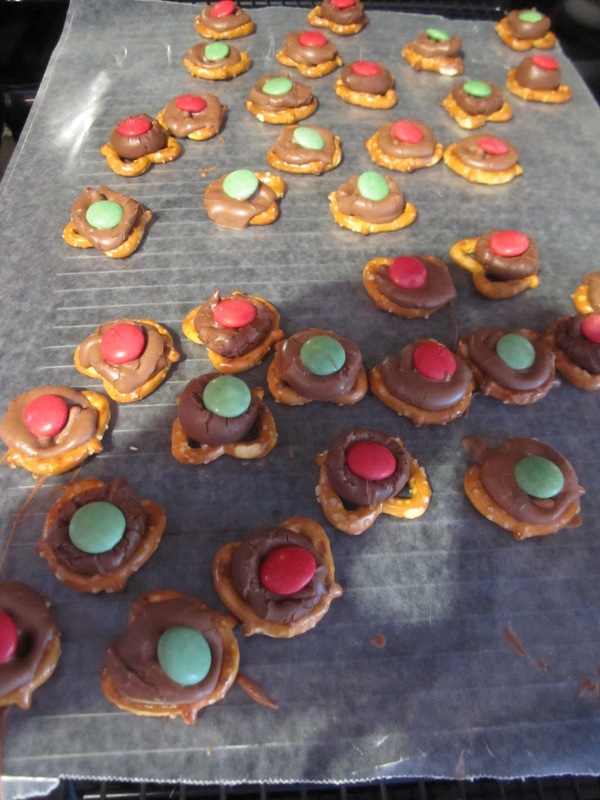 He worked very hard to unwrap each one and perfectly placed it on the pretzels all the while chatting about swimming and blowing bubbles and kicking his feet. When he was finished he was thrilled to be able to eat the left over's and I was melted to see that even though there were only three chocolates left over he still offered one to our dear friend who came for a visit and gladly ate the half melted offering, and the last one he offered to me. Makes a mommy so proud. 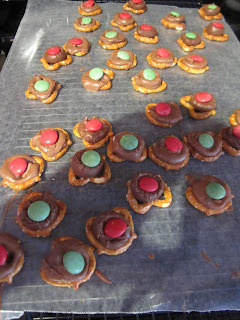 After melting the kisses in the oven I placed the smarties on as it was a pretty warm job for little hands! 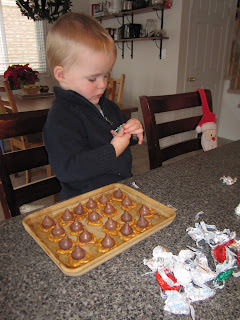 That night at swimming Max was so excited to hand out the treats and thank his teacher for all her hard work. What a lovely way to get him involved! What a fun idea! 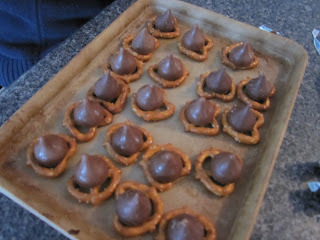 i've never seen kisses melted into a pretzel! Love it! Love that he can help you. Thats about the age of my girls and they love to help! He's adorable! 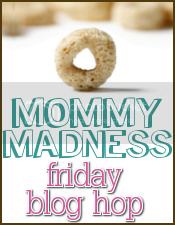 Thanks for sharing & linking up for the Mommy Madness blog hop! I'm following you Hope you'll follow back. Yummy! popped over from the blog hop at Mommy Moment. Hope that you will wanna see my blog and follow it too. Have signed to follow yours. Put together a comprehensive post with all kinds of neat ideas for arts and crafts, recipes, family traditions, freebies, discounts, and giveaways to go with the theme Around the world in December. Put tons of time putting such a huge post together so hope that you and your blog readers will wanna read it to get some great info. from it. Happy Friday!